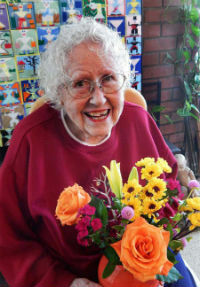 Margie Janssen Wells, 100, of Santa Barbara, Calif., formerly of Davenport, Iowa, died peacefully in her sleep on May 12, 2015, at Serenity House in Santa Barbara. Margie’s primary roles were wife, mother, grandmother, great-grandmother, homemaker and friend. She enjoyed many lifelong hobbies from sewing, baking (won many first-place ribbons for her bread), needle pointing, woodworking, drawing, playing scrabble to watching Judge Judy and Two and a Half Men. She had a great sense of humor and a ready laugh. She enjoyed spending time with her family and their friends who became second children to her. Her life was filled with tolerance, acceptance, gratitude, humor and mostly love. Margie is preceded in death by her husband, Justus Neff Wells of 38 years and her son “315” (aka William Wells) of Atlanta. Survivors include her sister, Dorothy Janssen of Davenport, her six daughters and one son: Jane Wells (Burt) Ferrini of Chicago, Suzanne Wells of Moline, Patricia Tierney of Santa Barbara, James N. Wells of Davenport, Mary Timothy (Michael) Jacobson of Carolina Shores, N.C., Nancy Wells of Santa Barbara, and Margaret Wells of San Mateo, Calif.
She will also be remembered by her seven grandchildren, nine great-grandchildren and many friends for whom she created her loving art and needlepoint mementos. A private service and burial were held at Memorial Cemetery in Davenport. A celebration of her life will be held in Davenport at a later date. The family extends their gratitude to all the staff at Serenity House for their extraordinary care and kindness.